← Kindergarten Registration- She is growing up too fast! Girl Scout Cookies- Which is your favorite? Are you ready? It’s that time again. Today starts Girl Scout Cookie Season. 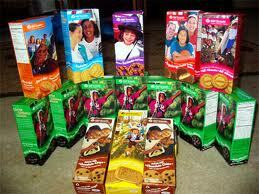 It is the time of year when I must hit up everyone I know to purchase a box, or two, or three of Girl Scout Cookies. And don’t hate me, but I am the mom who puts the order form in the staff room at work. Before you get too mad know that I do reciprocate and buy candy bars, coupon books, cookie dough, wrapping paper and whatever else the Local PTA’s can come up with to sell. This year a box of Girl Scout Cookie deliciousness will cost you $4.00. Over the years cookies have come and gone. Sugar Free Chocolate Chip, Thank You Berry Munch, and All Abouts are just some of the varieties that have been discontinued. For 2012 The Girl Scouts have decided to stick with their six best selling cookies. The Girl Scout Cookies that have survived the chopping block are: Savannah Smiles, Trefoils, Do-Si-Dos, Samoas, Tagalongs, and Thin Mints. It is an exciting year for The Girl Scouts as they are celebrating their 100th Anniversary. To mark this important milestone they are introducing a new cookie, Savannah Smiles. These lemon flavored cookies are dusted in powdered sugar and are shaped like a smile. Savannah Smiles are in honor of Girl Scout founder Juliette Low who was from Savannah, Georgia. If you think they sound familiar you are correct they were sold before under the name Lemon Coolers. I have to say Girl Scout Cookies are pretty popular. They are so popular that this year they even have their own app, the Cookie Finder. You can download this app to your Ipad, Itouch, or Iphone to help you locate where you can purchase cookies. The popularity of Girl Scouts Cookies is due entirely to the fact that Girl Scouts are marketing geniuses. They don’t flood the market with their cookies. By only offering them once a year they leave everyone wanting and waiting for Cookie Season. And they are probably the only products in the world that you cannot purchase online, so you must actually seek out a Girl Scout to purchase the cookie your craving. Therefore many people look forward to this special season all year. Who doesn’t love a Thin Mint? Those are my favorite. I find most people are fans of the Samoas. My family’s personal favorite is the Tagalong. Unfortunately, I do not like peanut butter and chocolate mixed. I realize this puts me in a category by myself since chocolate and peanut butter together seems to be a national pastime. I wonder if that is why my kids like them so much? They know I will never eat them. Now that the official selling season has begun I will need to assist my two scouts with their cookie sales. My generous sister usually sells some at her office as well. Of course I will need to make sure they each sell the same amount. Heaven forbid one sister sell one box more than the other sister. I shudder at the thought. Of course I need to buy several as well. Those boxes usually sit in the house for months because I will put them in a remote location to get them out of my way, and forget that I bought them. It also is a certainty that I will wait until the last minute to get the order form together and deliver it to that brave mom who has volunteered to be the cookie mom. I will whisk in a the last second with my order forms and a very big personal check to cover the cost of the Girl Scout Cookies. Last year I ran into a little glitch. The order forms were such a mess I decided to make new order forms on Excel. I made an order form for each of my two scouts. I even color-coded the columns to coordinate with the cookie box color. I was so proud of myself. How organized! Fast forward a couple of weeks I pick up our orders from the cookie mom’s house. Then head on home to sort. My daughter Grace is a big helper and sorting cookies is right up her alley. I went in to the kitchen and began getting dinner ready and she began her sorting. A few minutes of sorting goes by and she comes into the kitchen and complains that there aren’t enough cookies. As any good mother would do, I told her she must be mistaken and to check the lists again. Obviously she did something wrong. This scenario played out several times and resulted in me stopping what I was doing and going to check it out for myself. Which was when I discovered I had sent in the same order form twice. In my haste I must have printed two copies of the same form. I couldn’t believe it, what a major blunder! At the end of the day those people who I was too embarrassed to tell about my screw up recieved the cookies they ordered. Close friends and family got whatever was left. Thankfully they were good sports about it. This entry was posted in Food & Snacks and tagged 100th Anniversary of Girl Scouts, cookie finder app, favorite girl scout cookies, Girl Scout app, girl scout cookie phone app, girl scout cookie season, girl scout cookies, how much does a box of girl scout cookies cost, savannah smiles. Bookmark the permalink. 5 Responses to Girl Scout Cookies- Which is your favorite? Those are good. I am really surprised they got rid of the sugar free. I thought that everyone was so into sugar free. I suppose it wasn’t a big seller. Maybe the sugar free were discontinued because if you eat the whole box, disastrous consequences may ensue! Like the time I bought Jeana two boxes of sugar free chocolates and she made me take one, which I promptly ate. I tried to play golf but a sudden rumble in my tummy, and the rest I can’t even comment on! LOL! I love your comments. You are so funny. A great addition to my posts! Hello a huge thank you for giving absorbing information.I will be bookmarking this website for future updates.continue this interesting work.